"The reason I keep coming back to hospitality at the Glamorgan CCC is from the moment you arrive at the ground, everyone is so welcoming and the service and catering stands out above everywhere else. The quality facilities throughout the ground mean there is something to cater for every budget and it is all of the highest standard no matter where you are." Whether you choose private hospitality in one of our Executive boxes or join like-minded individuals in one of our range of superb hospitality lounges you will enjoy the full match day experience, whilst being able to spend time with your clients and guests in relaxed surroundings. Our 2019 international hospitality is on sale. 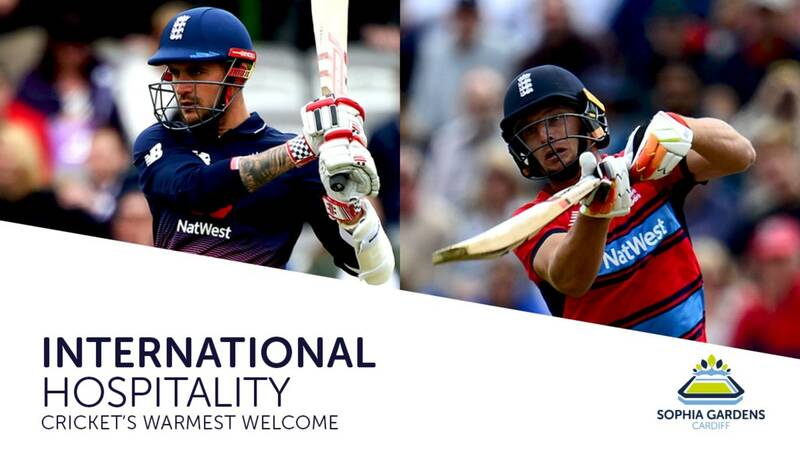 Call us on 02920 419 359 or email sales@glamorgancricket.co.uk and we'll give you all the information you need to make the right call on international hospitality. Our most elevated suite, the Wild Water Lounge enjoys panoramic views of our pristine playing surface. There's no minimum number of guests are required, however, private tables of 10 are available. "This unique open faced suite means you can enjoy the sunshine from the top of the Cathedral Road end, which also offers the best view of the action." See every ball swing, turn and bounce from behind the bowlers arm at the Cathedral Road end. Private tables are available for up to 12 people and with a maximum of 60 guests in the suite, it provides an intimate viewing experience. “Located on the top floor of the National Cricket Centre the viewing area from this lounge provides an unique perspective on events"
Comfortable surroundings prvode the perfect start to your match day experience and dining with guests able to choose to make full use of the viewing area to watch the action or step outside with a short walk from the lounge to your seat for the game. The Museum is situated on the first floor of the National Cricket Centre at Glamorgan’s headquarters at Sophia Gardens. Created in partnership with CC4, the Cardiff based multimedia company and e-learning specialists, the award-winning Museum celebrates the long rich history of cricket in Wales and Glamorgan CCC.